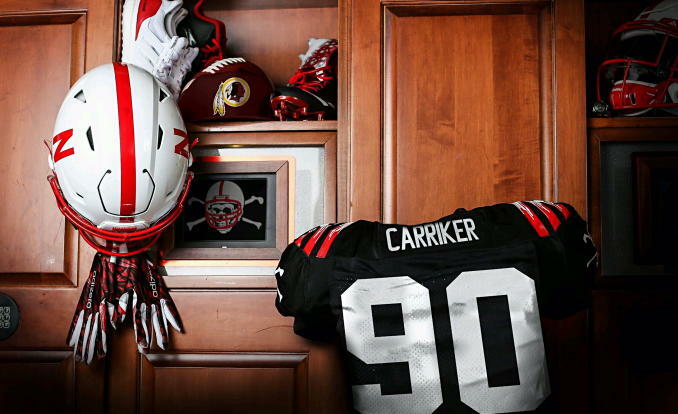 AC: Welcome, Husker Nation, to the Carriker Chronicles, the people's show. Bringing you the pulse of Husker Nation, and today I am joined by former Husker and current Detroit Lions starting running back Ameer Abdullah. How's it going today, Ameer? AA: Pretty good, Adam. Thanks for having me on. AC: Glad to have you. And I want to start with this off the top. I don't know if you heard the comments made by Iowa offensive coordinator Brian Ferentz about that school a little bit west of Omaha, but if you have heard them, what are your thoughts and reaction? AA: I haven't heard them. What did he say? AC: He called us that school a little bit west of Omaha, and we've only had a couple of draft picks the last two years when we've actually had five. He said the pipeline has dried up at Nebraska. I'm paraphrasing, of course, but he was kind of indicating that there are some lies being put out there on the recruiting trail and so on and so forth. AA: I'm a big believer in if you think something is going on, keep it to yourself. Sometimes I feel like people who have resentment toward another party like to shed negative light on the other party. That's a result of the inner resentment they have. He might have some jealousy toward how the recruiting has been going at Nebraska and how much more successful we are as a program. That's really all I have to say. He's a grown man. I feel like it was a mistake on his part. AC: I don't think I could have said that much better. I like that response. Now, onto Ameer Abdullah. How are you feeling? I know you had some injury issues last year. Are you 100%? How are you feeling? AA: I'm feeling good. I'm one hundred percent. I had all the procedures done last year, one that was from a pre-existing injury. I wanted to clean up a labrum issue that I had back in college. Wasn't expecting to sustain any injuries throughout the season so when I had to have back-to-back surgeries it was kind of a shock. I have a foot injury in the second week against the Tennessee Titans. But I'm back to full speed and it's helped me understand my body better. I'm are locked into what they need to do for my body for recovery as well as what I need to put in my body to maintain my health through the 2017 season. AC: So you're feeling good, you're going to be the future back for the Detroit Lions this season. What are some of your personal goals for this season? AA: Just consistency. I'm not a big stats guy. Of course we all have those statistical marks that we want to meet, but I feel like for me in order to hit those marks I just need to be consistent. That's with everything. For me, it starts with focus. Coming into the building every day ready to work, get in film study, and focusing on all the small things like footwork, aiming points, blocking techniques. If I put all those things together consistently, the statistics will be there. It starts with focus. AC: How would you say your first couple years in the NFL have gone? Obviously last year you were injured. Your first year you did really well making an impact on special teams also. How would you say you've transitioned from college to the NFL? AA: The biggest difference for me coming to the NFL was sharing a backfield. I've never shared the backfield with anybody. Coming into the situation I did with Detroit, sharing a backfield with Bell, Riddick, and last year it was going to end up with the majority of me being in the backfield but I ended up getting hurt. That's the main difference. As far as the first two years, not great but not bad. I'm pretty critical from my standpoint. I know there's a lot more out for me and if I can stay healthy this season, God willing, I know I can accomplish a lot. AC: Now I was watching the Nebraska Spring Game on my television and your pretty face was there commenting on the game. What was that like for you? Is that a second career? AA: That's something I've thought about. For me, and I know you can speak to this, Adam, having a great college and pro career, it's a lot different calling the game than when you're just a player. We know football. We know the X's and the O's and what it takes to be a successful player and a successful team. When you're calling and game you have to be more of a statistician. That's something I have to get better at, but it was my first time and I didn't think I did too bad. Hopefully I can continue to grow in that area and it could be a second career for me. AC: I thought you did pretty well. I was impressed with you. AC: What are your takeaways from the Nebraska Spring Game this year? AA: First and foremost, I was really impressed with the quarterback play. Even the young guy Gebbia brought an interesting dynamic before us with how well he orchestrated drives. I'm impressed, I feel like that is going to be a more consistent area for us this year. In my time we had more running quarterbacks but now they have more true pocket passers. I feel like that's going to help the offense be a lot more balanced. AC: Talk to me about the running back position because we have a lot of guys who can play. Tre Bryant, Devine Ozigbo, Mikale Wilbon, even Wyatt Mazour. Some of these other guys have stepped up. If you had to predict who the best couple running backs are going to be this year, who would it be? AA: Devine Ozigbo had the most experience going into the spring game. But, a guy from what the coaches have been telling me, and from what I saw in the spring game who has worked his way into the equation his Tre Bryant. Is a guy who is grown every year who I think can be dynamic out of the backfield. Where he is going to make his mark this year is catching passes out of the backfield. Also Mikale Wilbon. I know his background, he's a fighter. He's an inner-city guy from Chicago who I had one year of experience playing with. I know what he's capable of and I think he's finally starting to understand what they're asking of him to be an I back at Nebraska. AC: Did you have a chance to talk one-on-one with Mike Riley or Danny Langsdorf while you were there? And if you did, did they share anything with you? AA: I did, but they are always very close. They don't want to let out too much information too early. What I discussed with him was if there was a consistency with the quarterbacks throughout the spring, what was it? They said the day-to-day growth. Every day they were making significant strides. And that's going to be important for Nebraska because they have players like Demornay Pierson-El, Stanley Morgan, and some of those young guys working their way into the receiver spots. You have to get them the ball any way you can. If you can trust your quarterbacks to orchestrate drives with the right tempo and consistency, you have to like your odds going into the season. AC: I've always heard from the offensive guys and coaches I've spoken with that they prefer to go against a 4-3 defense rather than a 3-4 defense. Nebraska now runs a 3-4 as I'm sure you know. From your perspective, would you rather play against a 3-4 defense or a 4-3 defense? AA: I actually agree with that. 3-4 defense is tough because of the personnel. The guys up front are a lot bigger and have longer arms. they always do a good job of stopping the run, so for me as a running back when you go against guys like we have with Haloti Ngata, who are known to plug up the line, take on double teams, and cause piles that good stuff. It also as tough as a running back to identify who the linebackers are, who is going to be rushing for blitz pickup. Sometimes when you play teams like the Broncos, Von Miller is known as an outside rush guy. We give him to the line of scrimmage because we don't want our backs going against a guy like that. That can get confusing depending on what number he's wearing, you may ignore your responsibilities inside when you see a guy like Von Miller on the outside. AC: I interviewed Jordan Westerkamp last week and asked him for his prediction for the season and he strongly predicted 10 wins. So I'm going to ask you a slightly different question. I believe that at some point Nebraska is going to return to the perennial championship contender level. My question for you is when would your estimation be will that happen for the Huskers? AA: looking at how their recruiting and bringing guys in, it depends on this 3-4 defense. Who they bring in and how they bring these guys along. I feel like that is going to be the deciding factor because on the offensive end we have guys who can get the job done now. Building that depth at the linebacker position is going to be key for Nebraska as well as the defensive line. I'm right with you, I feel like they have the right things going to build toward that Championship essence. AC: You are now three years out of being at Nebraska. You're kind of an old man, never going to be as old as me, but what's it like going back now as opposed to when you were there three years ago? AA: Honestly, not a thing. I was there for the spring game calling the game for the Big Ten Network, I got into the city the night before. Fans were still coming up to me asking for autographs acting like we're seeing a rockstar or something. But for me, three years out, I graduated four years ago actually, it's still surreal to come back and get to experience it. AC: You are a former two-time lifter of the year at Nebraska. What are some of your favorite lifts and the speed and conditioning drills that you would tell the guys trying to get into college or the NFL? AA: One of my favorite things is a split squat. It's an explosive move that builds fast-twitch muscles and helps with speed. It's also an injury prevention type of left as well. All lower-body it really. Being a running back, being strong download is big for us. For speed work, you can't really coach linear speed other than just running all the time, but for change of direction and quick twitch, I do the five-step vibe a lot, You know one of the combine drills where you change direction? I also do the four corner wave drill where you backpedal, shuffle side to side, and sprint forward. Just working on that lateral movement, because when you get to the league that’s really what separates a lot of guys. Who can get to appoint quicker than everybody else? That’s really the basis of a lot of my speed training. AC: What’s your most memorable moment or favorite memory from your time as a Husker? AA: We lost the game actually, but playing out at UCLA in the Rose Bowl. You see the Rose Bowl on TV all the time. It’s one of the Pinnacle of college football to play in. We were backed up on our own 3-yard line we’re in a zone-read. Taylor Martinez pulled it and outran the entire defense. I knew he was fast, but that was the first time I’d really seen him open up. I still go back and watch that play now and I think, man, I’ve never seen somebody that fast on the football field. That’s one of the most memorable moments. That and the block that Kenny Bell had on the guy in the Big Ten Championship after we were getting our asses kicked anyways. Kenny killed that guy and it just shows what type of player he was and at that point, I knew I could go to war with him anytime. AC: Yeah those were a couple of pretty memorable plays. I know exactly which ones you’re talking about. Now, are there any behind-the-scenes stories either at Nebraska or in the NFL getting ready for the draft that you’d like to share with the fans? The fans love that stuff. AA: I have a couple of them actually. This one’s kind of messed up, but it’s really funny. We were playing in Michigan my sophomore year, and a fan had gotten into it with somebody. Taylor Martinez’s dad was yelling. He slipped and hurt his knee and was in a crazy brace when we came back into the locker room. We won the game, so we were all happy but he was cussing out all the trainers and everybody trying to help him. We were just trying to figure out what was going on. At the time, Taylor's little brother Drake was a recruit. He wasn’t there yet, so I asked him what happened and he said his dad slipped and dislocated his knee. I was like, man, the parents are getting hit harder than the players on the field. It was intense, but it was funny. It just shows you how crazy things can get in the stands. AC: Just the one, or do you have a couple? AA: A couple of them are x-rated so I don’t know if I should say them here. AC: That’s all right, we won’t get anybody in trouble here. I appreciate you joining the show and I appreciate you taking the time. You have my number, if you ever need anything, hit me up. AA: To THROW THE BONES!